How did Anne Frank's diary become one of the most-read books in the world? And how did Anne become an international icon? Read here how Anne's diary still inspires millions of readers. How did a diary—abandoned in a fragmentary state, and for five years known to exist by only a few people—become one of the world’s most widely read books? And how did its author become a figure of international renown, despite having died two years before the book was first issued? As remarkable as Anne Frank’s diary is, the story of its publication and its engagement by millions of readers around the world over the past seven decades is equally powerful. 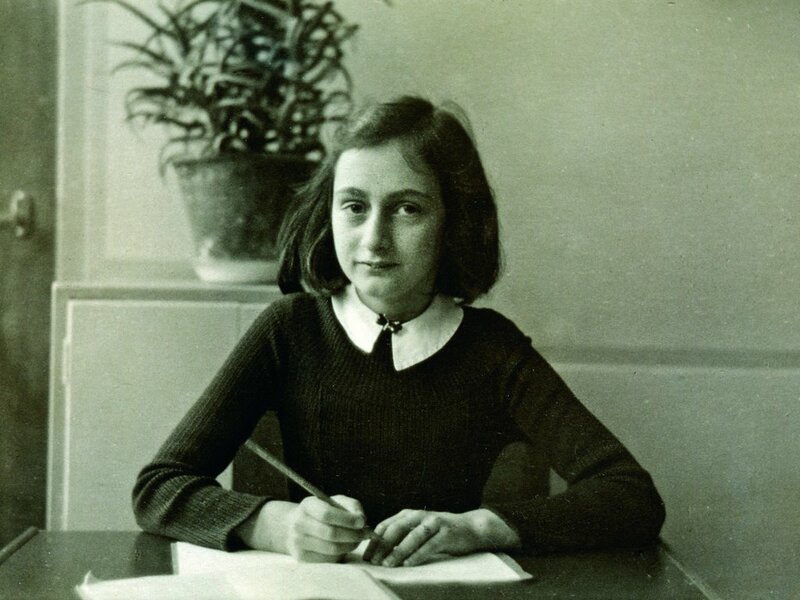 Anne began her diary in June 1942, when she turned thirteen years old, just weeks before her family went into hiding in the annex behind the business office of her father, Otto, at 263 Prinsengracht, in order to escape the persecution of Jews in Nazi-occupied Amsterdam. She continued keeping her diary during the following two years while in hiding with her parents, her sister, and four other Jews. Responding to an appeal by the Dutch government-in-exile to people in the Netherlands to document the Nazi occupation, Anne started rewriting her diary during the spring of 1944. Envisioning it as a work for publication, she transformed her original entries into a kind of epistolic novel. Anne’s reworked diary remained incomplete at the time of her arrest, together with the other Jews with whom she was hiding, by the SD (Sicherheitsdienst) on August 4, 1944. 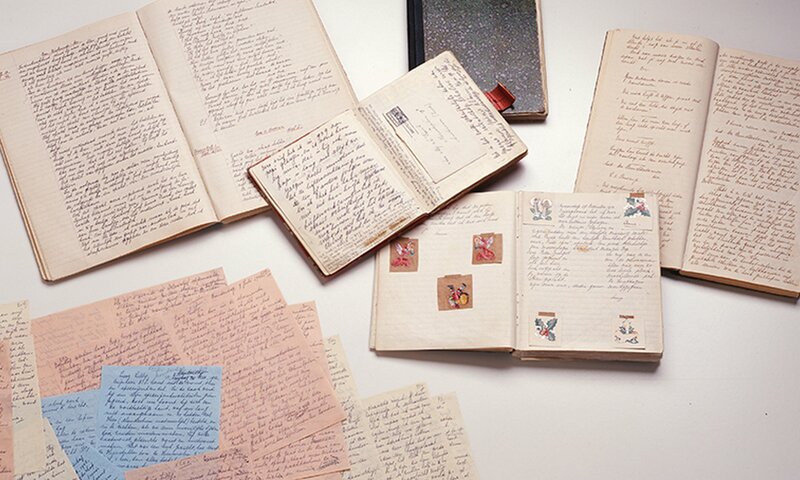 Original manuscripts of Anne Frank, with the diary, the loose sheets, and the notebooks with short stories and beautiful sentences. Shortly afterwards, Miep Gies and Bep Voskuijl, two of the people who helped hide Anne and the others, discovered her diary, notebooks, and other papers in the annex. The following year, after it was certain that she had died during the war, Miep gave all of Anne’s writings to her father, the only member of her immediate family who had survived the Holocaust. Otto Frank found his young daughter’s writing profoundly moving and remarkably insightful, and he soon shared some excerpts from her diary with his mother and a few close friends. Persuaded to publish the diary as a book, Otto compiled a version of the text from the diary’s two versions as well as some of the short stories Anne had written while in hiding. 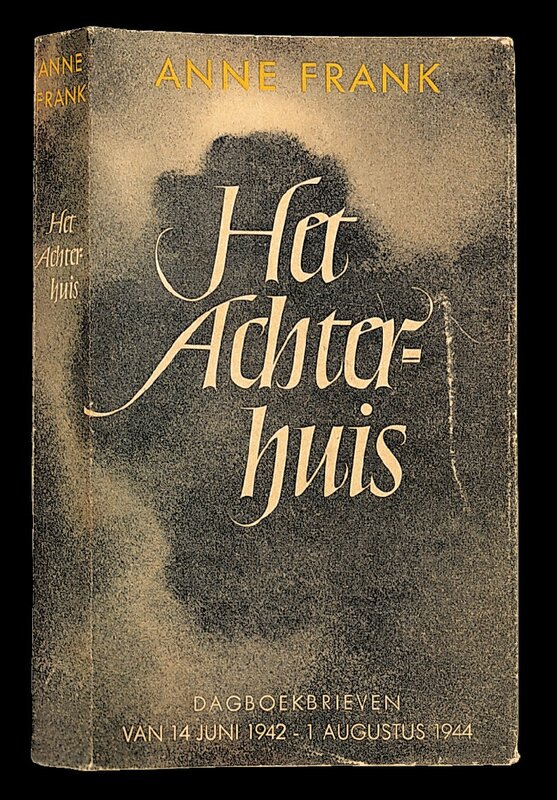 The first edition of ‘Het Achterhuis’ (‘The Secret Annex’) by Anne Frank, from 1947. The cover was designed by Helmut Salden. Photo collection: Anne Frank Stichting, Amsterdam. Het Achterhuis (“The Annex,” Anne’s proposed title for the book) was first issued in 1947 in an edition of 3,000 copies. The diary was translated from Dutch into more widely read languages shortly thereafter, beginning with French and German in 1950 and English in 1952. Within a few years, a dramatization of Anne’s diary was staged on Broadway, then performed internationally and filmed in Hollywood. The Franks’ former hiding place at 263 Prinsengracht became an official museum—the Anne Frank House—in 1960. By then, Anne’s life story had become widely familiar around the world, establishing her as the most well known victim of Nazi persecution. 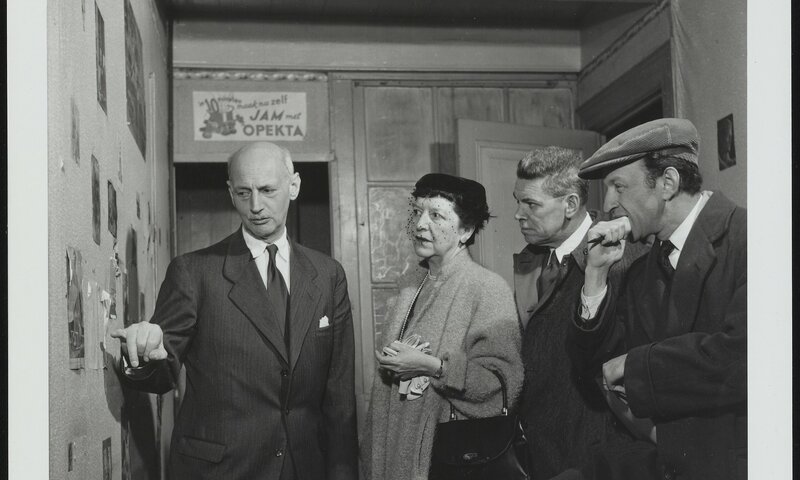 On the left: Otto Frank in 1954 in Anne’s room in the Secret Annex. On the right: the writers and director of the play ‘The Diary of Anne Frank’, which opened on Broadway in 1955. Otto Frank’s role as caretaker of Anne’s diary was definitive. On one hand, he was dedicated to his daughter’s life and work being widely known through translations of the diary (into more than thirty languages by 1970) and its dramatization. His motive for doing so was rooted in a commitment to advocating for universal human rights as a response to the Holocaust. On the other hand, Otto was committed to a close regulation of how Anne’s life and work would appear in public. Under his aegis, there was only one licensed drama based on the diary, and permission to excerpt Anne’s writing in books, plays, or films was granted on a very limited basis. Only a small number of sites or institutions dedicated to Anne’s memory were sanctioned, and there was to be no official Anne Frank memorabilia. Otto’s approach to safeguarding his daughter’s legacy proved to be in tension with the diary’s many readers who engaged Anne’s writing and her life story on their own terms. Teachers began to assign the diary in classes on literature and history, thereby helping to establish reading the book as a widely familiar adolescent rite of passage. Authors of fiction and poetry have engaged imaginatively with Anne’s inner life or have conjured alternate outcomes for her. More recently, especially after Otto Frank’s death in 1980, hundreds of performance works—plays, feature films, musical compositions, dance pieces—have realized desires to embody Anne and to hear and see her in action. Visual artists explore Anne’s iconicity or relate to her as an aspiring—and inspirational—artist. Memorial tributes in the form of gardens, parks, and schools named after Anne provide her with sites of public remembrance around the world. Religious engagements—whether paying homage to her memory in requiems or incorporating her words into the celebration of a Passover seder—relate Anne’s life and work to sacred ritual and spiritually informed ethics. Growing in number and variety over the years, these many different forms of connecting with Anne constitute a noteworthy phenomenon in its own right. It is largely the work of individuals or grassroots communities who, inspired by encounters with the intimacy and artistry of Anne’s writing, forge their own creative attachments to her. 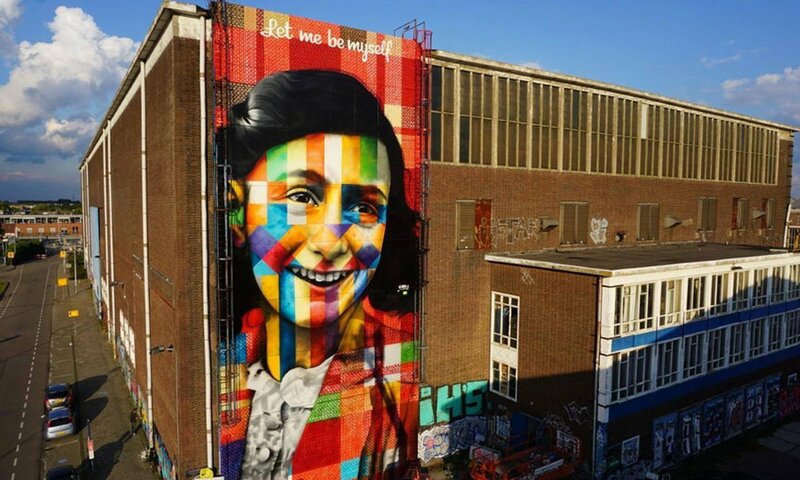 Brazilian artist Eduardo Kobra made a gigantic graffiti portrait of Anne Frank at the NSDM shipyard in Amsterdam. None of these attributes either fits Anne perfectly or completely explains her significance; rather, this complex of paradigms is key to understanding Anne Frank as an icon. Indeed, her posthumous renown exemplifies how the meaning of an icon is not fixed; instead, its significance shifts as notions of what an icon represents respond to the evolving desires of those embracing it. The values invested in Anne’s life and work reflect larger developments in how people across the spectrum of nationalities, religions, and ideologies have grappled with the significance of the Holocaust. Greater interest in studying the writings of young women has prompted reappraisals of Anne’s diary as a literary landmark. And the inspiration that activists have found in Anne’s life and work have made her an emblematic figure of human rights, notwithstanding the fact that her murder at the age of fifteen cut short her potential of becoming a public advocate for social justice. Anne Frank’s renown has endured beyond the lives of almost all the people who knew her; it will soon outlast her cohort of eyewitnesses to World War II. As remembering the Holocaust passes beyond the last generation of people who experienced it, Anne will remain a fixture of its public recollection as one of the best known of this genocide’s millions of victims. 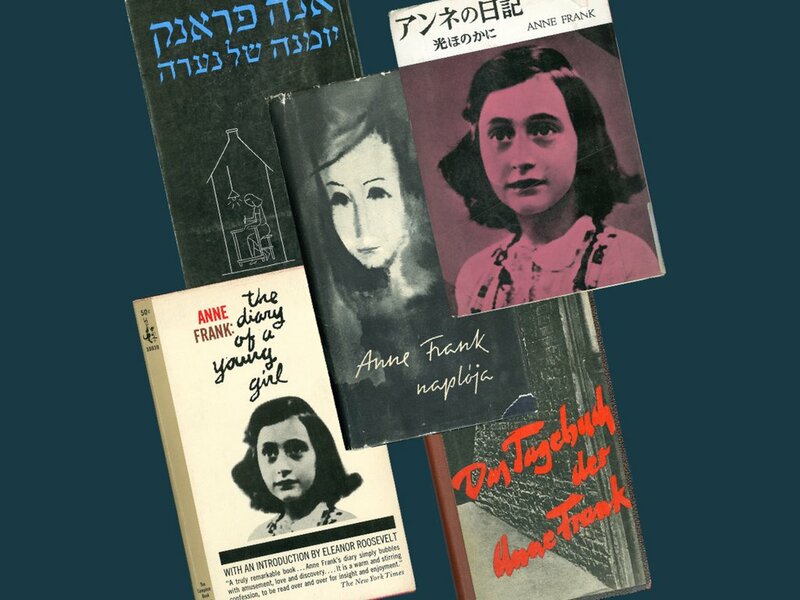 Rethinking Anne Frank’s iconic stature will also continue, as new generations read her diary and learn about her life, and as the passage of time both suggests more possibilities for ascribing symbolic value to Anne and raises new questions about the implications of doing so. Today, when people read Anne’s diary or visit the building in which most of it was written, they not only encounter an extraordinary work, created during the Holocaust. They also discover that they are joining a vast international body of this book’s readers and the museum’s visitors, each of whom forges an individual understanding of Anne’s life, which she revealed with deeply personal candor in her writing. There is much to learn from the story of this one young woman amid the terrible times in which she lived and died. In addition, the wealth of responses that Anne Frank has inspired is itself instructive, revealing the many possibilities of finding meaning at this powerful confluence of remembrance and imagination. Jeffrey Shandler is Professor of Jewish Studies at Rutgers University. He is the author of Holocaust Memory in the Digital Age: Survivors’ Stories and New Media Practices (Stanford University Press, 2017), and co-editor of Anne Frank Unbound: Media, Imagination, Memory (Indiana University Press, 2012). Enzer, Hyman A. & Solotarof-Enzer, Sandra (eds. ), Anne Frank: Reflections on Her Life and Legacy (Urbana, IL: University of Illinois Press, 2000). Kirshenblatt-Gimblett, Barbara & Shandler, Jeffrey (eds. ), "Introduction". In: Anne Frank Unbound: Media, Imagination, Memory (Bloomington, IN: Indiana University Press, 2012). Prose, Francine, Anne Frank: The Book, The Life, The Afterlife(New York, NY: HarperCollins, 2009). Steenmeijer, Anna G. (ed. ), A Tribute to Anne Frank. (Garden City, NY: Doubleday & Co., 1971). How did Anne's diary become so famous?